MARCH 20th may be remembered as Budget Day, but it was also when design and technology got a proper airing in Parliament. These quotes can’t do justice to the full 27-minute debate but it was heartening to hear Peter Luff referring to the sound and prolific advice he had received. Among his quoted contributors were the D&T Association and (I suspect) many that were prompted by DATA’s inspirational ‘BelieveinDandT’ campaign. Credit where it’s due, we can be proud of the work DATA has done – and continues to do. Now is where the work really begins and DATA will be key partners inhelping the government shape up the new curriculum following this consultation phase. It would be rash to guess what is in store but I think we can be optimistic and confident of a few things. STEM has featured large in the debate and ‘rigour’ is one of Michael Gove’s prime ambitions for the new national curriculum. I doubt this means a return to teaching a curriculum of specified practical skills but will mean (I suggest) that what is taught will need to be clearly structured and closely scrutinised to ensure students develop independent capabilities. The only specified capabilities mentioned anywhere in debate so far are cooking skills and ‘2D and 3D modeling using computers and IT’ – sounds like CAD/CAM to me. CAD/CAM training is a very significant part of what we do. We run a programme of courses at our head office in North Wales and at the Intech Centre in Winchester. Barely a week goes by without TechSoft delivering bespoke Training to individual schools or consortia. Teachers (and students) frequently run into problems with CAD by approaching tasks as ‘image making’ – this is OK for graphics work but CAD needs a different approach. A drawing will only deliver accurate and efficient CAM output if number and geometry have been properly included at the CAD stage. It’s not hard to see how CAD/CAM can be usefully ‘beefed-up’ with some vital STEM content. 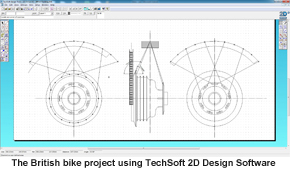 TechSoft 2D Design provides all the tools you need and one example here shows how I used 2D Design to figure out how to fit an Italian rim to a Spanish hub for my current	British bike project. CAD made the maths easy for me, without it nothing was going to fit – and I’ve still got my fingers crossed! Rigour is perhaps harder to embed and assess. 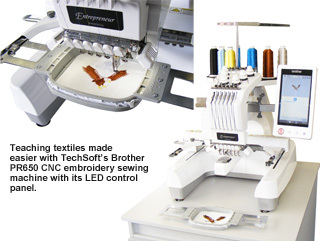 If the drawing is right then TechSoft machines will produce extremely accurate results, but are they doing this in an efficient way that makes best use of materials? We know that there is great practice out there already. For many, change may well be ‘it ain’t what you do – it’s the way that you do it’!